Pope Francis is a thoughtful man whose views should be taken seriously. So his unusually dramatic declaration last week that the world is at war deserves closer scrutiny. The pope was responding to the shocking murder in Normandy of a Catholic priest, Father Jacques Hamel, by two French-born Isis recruits and two earlier Islamist attacks in Germany. But his remarks raised wider questions reaching far beyond the immediate struggle against random acts of terrorism. Is Francis right? Is the world at war? Looking at recent events, including the Bastille Day atrocity in Nice, a string of lesser attacks in German cities and, for example, the ongoing, merciless bombardment of 300,000 people trapped in what remains of Aleppo, it is tempting to answer with a heartfelt “Yes”. Day after day, our televisions, radios, mobiles and newspapers deliver awful tidings of yet more egregious examples of man’s inhumanity to man. Yet our perspective is skewed. Figures compiled by the University of Maryland’s Global Terrorism Database show that, in western Europe, the number of civilians killed as a result of terrorist acts has fallen sharply in recent years from peaks in the 1970s and 1980s. Even then, at the height of IRA, Basque separatist, Red Brigades, Baader-Meinhof and PLO activity, the annual toll numbered a few hundred. Current fatality levels in Europe are significantly lower, despite the rise of Isis. In point of fact, the vast majority of civilian deaths from terrorism in 2015 – 74% – were confined to five countries: Iraq, Afghanistan, Nigeria, Syria and Pakistan. Or looked at another way, between 1969 and 2009, there were 38,345 terrorist incidents around the world. Of these, 2,981 were directed against the US, while the remaining 92% were directed at other, mostly poor nations. The worst single atrocity since 9/11 took place this month in Baghdad, where Isis bombs killed hundreds. If the pope’s claim about a world at war is set against a broader measure of armed conflicts, similar doubts arise. According to the International Institute for Strategic Studies, about 167,000 people died in armed conflicts in 2015, historically far fewer than in the post-colonial and Cold War periods of the last century. This figure is itself distorted by Syria, which accounted for 55,000 of the total. Again, a handful of countries accounted for most of the remaining deaths, notably Nigeria, Afghanistan and Mexico. These figures suggest three things: that, overall, worldwide levels of organised state against state, internal state and non-state (terrorist) violence have significantly declined over the past 50 years; that the conflicts that persist are mostly confined to a diminishing number of countries or regions, not in Europe or the US; and that most parts of the world are enjoying an unprecedented period of prolonged peace. The big picture, as delineated by academics such as Harvard’s Steven Pinker, is not one of a “world at war”, but of a world that may, slowly, be learning to deal with problems by non-violent means. Such conclusions plainly fly in the face of popular, western perceptions of heightened physical threat, as enunciated by the pope. This may be because violence, particularly Islamist terrorism, is suddenly much more in evidence on our own doorsteps. It may be because, thanks to mass media and the internet age, ordinary citizens are more aware now of global contemporary events than at any time in human history. The result is an exaggerated, disproportionate sense of the dangers presented by our own times. This may also stem from woeful, collective ignorance of recent and not so recent history. But this disconnect between the objective reality of present-day conflict, the emotions and fears surrounding it and the language and terminology used to describe it, may be deeper rooted. As Francis suggested, the shared conception that we are living in a time of war arises from conflicts in many other dimensions, such as the “war” over disappearing natural resources and environmental protection, the “wars” on poverty, on drugs and on preventable disease, or the “war” between business interests, represented by global corporations and international capitalism and the common people’s recurring aspirations, now ever harder to crush or deny, for fair, equal and just societies based on human rights, shared responsibilities and agreed laws. Maybe Francis was also pointing, opaquely, to what might be termed a war of minds, a global war of ideas, one that rages ever more fiercely in a 21st century whose dawn, supposedly, marked the beginning of a post-ideological age but that now grows desperate (and violent) in its search for belief, certainty, conviction and truth. How else to account for nationalists, populists, demagogues, charlatans and rogues from Trump Towers to Vienna’s far-right Freedom party to France’s Front National to Greece’s Golden Dawn, which peddle absolutist solutions, perverse panaceas and divisive, separatist slogans with such evident, partisan support? And how else to interpret the religious rift, or fitna, within Islam between Sunni and Shia, and between Islam and the west, if not in terms of a battle of dogma and belief? The pope may be correct that this is not a war of religions, certainly not a war led by established religious leaders such as himself. But to claim that the current, intensifying global battle for new, viable credos for the new century is not, in part, a religious and spiritual struggle, too, is surely delusional. Thomas Hobbes believed man’s natural, eternal state was “warre”. 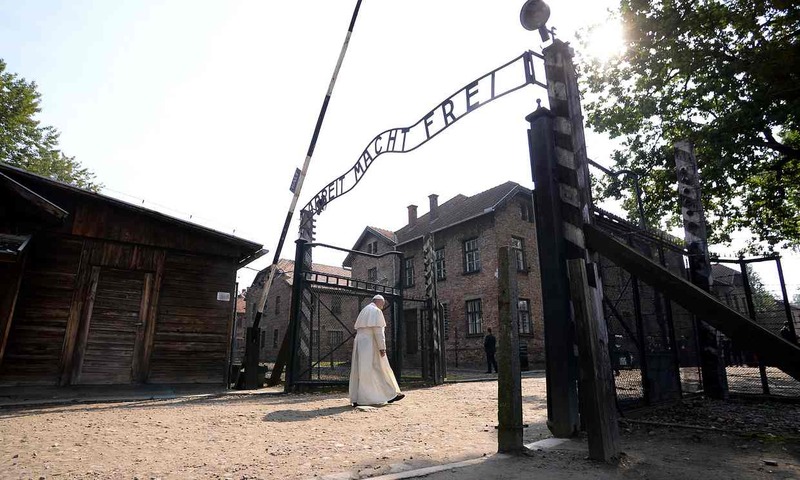 The aim and duty of every human society before and since has been to prove him wrong – and to resurrect Francis’s “lost peace”. The shockwave from the Brexit vote now reverberates through Europe. The dismay felt by so many in the UK is shared on the continent. Some of you reached out to us before the referendum, asking us to stay and stressing our common interests. Now it is our turn to appeal to you. Rebuffed by the result, and alienated by the crude triumphalism of Nigel Farage and other leavers, you may consider any request an impertinence. Your citizens have been among those targeted by the xenophobia unleashed. Continental Europeans may feel we do not deserve an audience. Almost half of those who voted sought to continue our membership. The Guardian was one of the most determined voices on this side of the divide. But we, like the rest of the 48%, must now respect the verdict that we dreaded. You assumed that British pragmatism would triumph. We share your shock and anxiety. Tempted as you are, don’t write us off entirely. 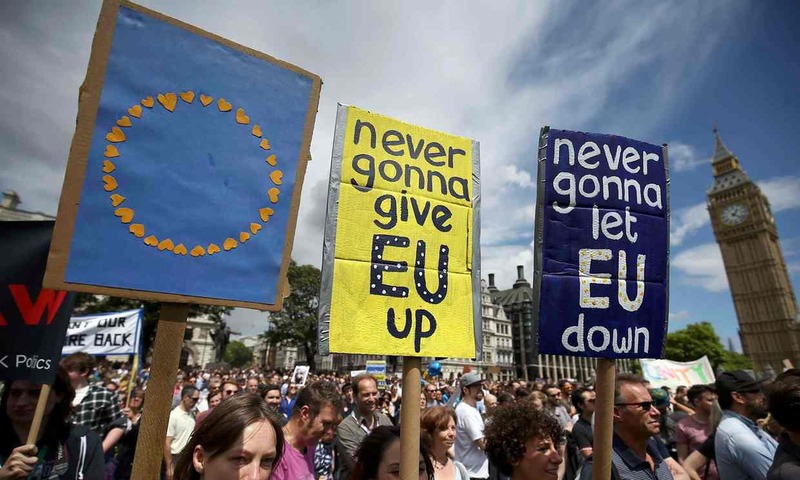 Many Britons seek the closest possible partnership with the European Union, and it is more urgent than ever to continue cooperation through every viable means. Some of you are angry. Britain was already seen as an unwilling partner, dragging our feet and demanding endless concessions. Many more now see us as a wrecker, too: gambling with a fragile European economy; imperilling an institution created to safeguard peace. Others feel pity or contempt for a nation that backed Brexit on a series of fantasies and lies, already retracted, or schadenfreude as the cost of the folly becomes evident. You may wish to punish us, or simply tell us: good riddance. Britain should not expect special treatment. Nonetheless, at this precarious moment, we ask you to pause – in all our interests. Above all, we need time. Britain voted against membership; we did not vote for an alternative. The public has not fully confronted the choice it faces between turning its back on the single market, or accepting continued EU migration in whatever form. For sure, make it clear to Brexiters that they cannot have the rights that come with the EU without the obligations. Spelling out Britain’s choices may help us to be more realistic. The country has decided against continuing down the same path, but our new route and eventual destination are unclear. There is a great deal to think through, and further decisions to make. They could involve parliament, perhaps even a general election. You hope for certainty and stability, but pressing too hard for the invocation of article 50 could force us to rush into choices that you may also regret. While Britain chooses a captain for turbulent waters, you will be preoccupied with your own decisions, cast into starker relief by the referendum vote. The UK no longer has the right to express any preference as you determine “how much” and what kind of Europe you want. Seeking to punish us to prevent further exits is an understandable urge. The right policy will be that which prevents Britain’s exit becoming a ruinous catalyst. Across Europe, there is disengagement from mainstream politics, anger towards the elite and a hunt for foreign scapegoats, and in many places these have coalesced into anti-EU sentiment. We shared your alarm as Marine Le Pen’s Front National and other far right parties celebrated the British decision. Large numbers of people feel ignored and ill-used, with little sense that they are benefiting from integration. In the UK, lies about straight bananas and exaggerations about the EU’s opacity fuelled feeling against the institution, compounding a sense that the political classes are out of touch with ordinary life and have often put profits before people. The UK must establish new bonds at home without turning its gaze entirely inwards. Let us continue to work with you wherever we can. We don’t expect to take the lead or make the rules; we can still offer expertise, resources and intelligence in areas such as security. Cooperation between our citizens – cultural collaborations, academic exchanges – in the long run does most to bring Europe closer, and will be more crucial than ever. Remember that younger Britons who voted were overwhelmingly pro-European, and help us to nurture that spirit and the opportunities it may one day present. Britain, once outside the EU, cannot and should not expect a swift return. It would be politically dangerous at home; it would require generosity on your part. But those facing Brexit with reluctance hope that one day we may rejoin the club. Please, bid goodbye in sorrow, not anger; and for all our sakes, do not bolt the door. British democracy still starts with Westminster. Brexiter Tories will not get a grip until they accept that, and Jeremy Corbyn’s leadership will continue to crumble until he does the same. The British constitution was traditionally summarised in a single sentence: “The crown in parliament is law”, which is to say that things passed by the Commons and the Lords and then signed by the monarch would come to pass. Like every one-liner, it was an over-simplification, blurring over the role of international treaties and the role of the courts among other things, but – at this time of tumult – it is useful to recall the most fundamental of our ground rules. Britain is a parliamentary democracy, and though we do not love our MPs, the law of the land, the taxes we pay and the hands that hold the levers of power are all inescapably questions for them. The chaos cascading through both the UK’s main parties just now is because they have, in different ways, forgotten this basic truth. The referendum came about because David Cameron could see no other way to manage an irreconcilable minority of Europhobes among his ranks. But in taking such a weighty decision away from parliament, and then producing an answer that the overwhelming majority of MPs disagreed with, he has ended up destroying his premiership, his government and – for the moment, at least – the governability of the realm. With the European foundation stone of the Cameron government’s foreign and economic policies shattered, the logic of the referendum is that a new administration must be established – built upon new Brexit policies. There is, however, currently no majority among the MPs – who would have to constitute that government, and then sustain it through confidence and supply – for these new policies. Thus there are rising expectations that the new Conservative leader now set to be installed on 2 September will engineer an early election to seek a fresh mandate, even though this would involve circumventing the law on fixed five-year terms, and going to the country a mere 16 months after it made a decisive choice for Mr Cameron. What a mess. Friends of Theresa May are, reportedly, whispering that as the continuity candidate, she might be able to avoid the early dash to the polls. In truth, even if this low-key remainer can prevail, there could be pressure because, thanks to party rule changes since the 1990s, she would be the first ever prime minister in British history to be chosen by party members out in the country, rather than MPs. And in a parliamentary system, that raises questions of legitimacy. These are questions that Labour activists also need to think through, as they consider the future of Jeremy Corbyn, after the total collapse of his authority at Westminster, which has been wrought by the mass resignation of his shadow cabinet. If he wishes to carry on, he will surely now be required to fight a fresh leadership election. The Labour party rule book explicitly puts the choice of the leader in the hands of the members who elected Mr Corbyn in such numbers last year. It would thus be sharp practice, even if – which is doubtful – it were legally possible, for parliamentarians to block his name going forward to the ballot. The members, however, will need to reflect on the job they would then be choosing someone to do. In the early years of Labour history, the leader was simply called the chairman of the parliamentary Labour party, and the MPs alone made the choice right up until 1981. Even in opposition, the chief day-to-day task is to lead the members on the green benches, as they challenge the government. If a general election is in prospect, attention inescapably turns to whether or not an aspiring PM could ever command a post-election Commons majority, because without it they could pass no law, raise no taxes nor survive in post. Some, but not all, of those who have walked out of the shadow cabinet have personal or ideological axes to grind, and there has been a dismal collective failure to explain who and what they believe should be put into the place of Mr Corbyn and his programme. That failure is now the greatest reason many members will see to stay loyal if he stands his ground. Weighed against it, however, must be his own failure to dispatch the core duty of holding a shadow ministerial team together. Brexiters can hail the popular will in the referendum, just as Tory and Labour activists alike can talk about their own “sovereignty” in picking a leader. None of this rhetoric, however, gets around the reality that parliament is indispensable in getting anything done. Neither policies nor politicians who forget it are likely to endure.